The last few decades have witnessed tremendous progress in Computational Chemistry and Physics due to ever more refined and efficient theoretical algorithms that allow us to solve, albeit still approximately, some of the most fundamental equations that govern chemical and physical processes. As a result, Computational Chemistry has penetrated many sub-disciplines of the Natural Sciences in the last thirty years, from Astrochemistry to Material Science and Biological Physics as a complementary tool that aids our interpretation and understanding of Chemistry and Physics at the molecular level. 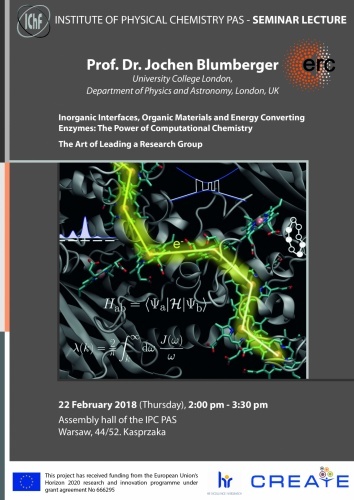 In my talk, I will survey a number of studies where our group has used modern electronic structure calculations as well as state-of-the-art molecular dynamics simulations to gain mechanistic insight into a diverse range of chemical and physical processes. I will present results on the atomistic structure and dynamics of transition metal oxide/liquid water interfaces relevant for electrochemical water splitting. I will explain the challanges one faces when it comes to describing charge transport processes in organic materials that form the active layers of organic light emitting diodes and organic solar cells, and I will present our simulations of electron flow in some of the most intruiging enzymes that have evolved to export electrons from the inside of the cell to extracellular space. Finally, I will describe how small inhibitor molecules diffuse to active sites of hydrogen-converting enzymes (hydrogenases) and the theoretical method we have put forward for prediction of mutations that could interfer with ligand diffusion and binding. Leading a research group requires some of the skills we thought we would never need when we decided to become a scientist. After years of post-doctoral work where scientific reasoning, realism and painstaking attention to detail counts everything, we are suddenly confronted with writing ambitious grant proposals that promise to solve the many problems of this world. After a 10-minute conversation with the interviewee we should be able to tell if he/she makes a successful PhD student or Postdoc or if most of the answers given were just hot air. We are supposed to motivate our group members, comfort them if experiments give zero results after years of preparations and encourage them to become the leaders of the future. The ``human component" that comes into play when leading a group should not be underestimated - it is (almost) as important as the science itself. I will give a (necessarily) personal view on some of the issues a scientific group leader faces, including best practices in leading a group, optimal group size, hints about hiring and interviewing, publishing and writing of grant applications.